If you’re looking for an excuse to get out of cooking dinner and to dig into a bowl of cereal instead, look no further than the Harvard School of Public Health. The school just released a study finding that people who eat high fiber cereal enjoy a 34 percent reduced risk of death from diabetes. More, they also have a 15 percent lower risk of death from cancer. Cereal munchers even live longer, according to the study. In other words, “Snap, Crackle and POW” – forgotten breakfast favorites are your new secret health weapon. But is packaged cereal really all that healthy? We’re partial to cereal and low-sugar granola slathered with kefir and fresh fruit for a healthy, easy parfait, but you could also sprinkle some on top of a probiotic smoothie bowl, or on top of your favorite smoothie. Heck, cereal-topped Frozen Kefir is a great way to sneak more “healthy” into dessert! 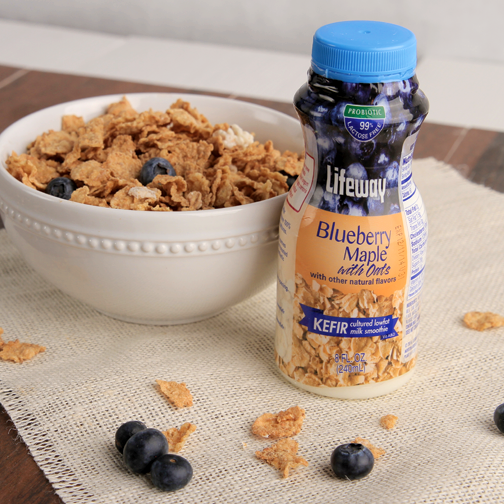 If your short on time, grab a bowl, your favorite cereal and a bottle of kefir – breakfast is served! Need more ideas for adding fiber to your diet? Check out our fabulous Kefir with Oats. Three grams of fiber pair with 12 live and active probiotic cultures for a complete meal on the go.